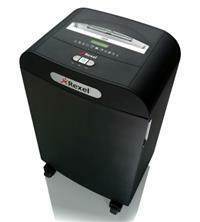 The Rexel Mercury RDM1150 is a large office shredder which shreds documents into approximately 2000 1.9x15mm pieces. This gives it a high P-5 security rating, meaning it is suitable for shredding even secret papers. Recommended for an office environment with up to 20 users, the shredder can take 12 sheets of 70gsm paper at a time and has a large 50 litre bin capable of holding 500 shredded sheets. It can also be used with Rexel’s recyclable bags, product code 2102441. Alternatively, AS1000 plastic waste sacks can be used (Rexel code 40070). Additional features include Rexel Mercury’s Jam-Free Technology which means the shredder will only shred stacks of paper within its sheet capacity, and an automatic lubricating mechanism – you simply keep the oil filled up (Rexel product code 1760049) and the shredder takes care of the rest! The RDM1150 also has an induction motor for quieter operation, handy in a shared office environment.